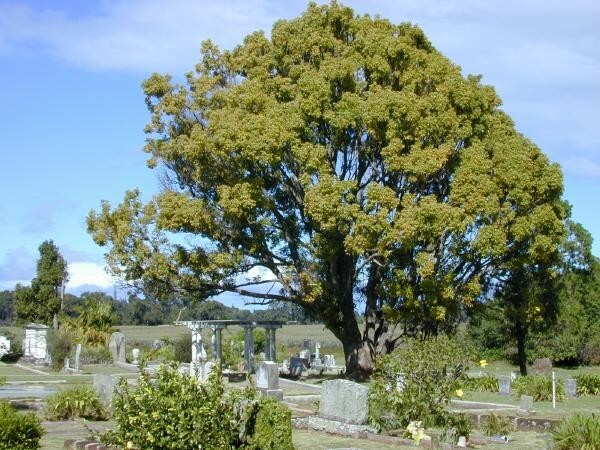 The camphor tree is a broadleaved evergreen growing to heights of 15 - 30m achieving a canopy that is twice as wide as its height. According to FFI (2003), the leaves of C. Camphora are 5-8cm long, 1.5-5cm wide, oval-shaped, and taper into an acute apex. Leaf bases are wedge-shaped or rounded and the leaf surfaces are bright green and lustrous above, duller and slightly greyish-green below. The fruit of C. Camphora is a black drupe, about 2cm in diameter, held by a leathery floral, funnel-like tube that occurs in clusters at the end of a stalk.The leaves of the camphor tree give off a strong odour when crushed making it easy to identify. Major chemical compounds in wood and leaves of C. camphora are camphor, safrole, linalool, 1,8-cineole, a-pinene, a-terpineol, ?-cymene. According to LCD (2000), C. camphora is widely planted as a shade tree, screen, or windbreak. In China and Japan, it is grown commercially for its medicinal oil. LCD (2000) indicates that C. camphora prefers fertile, sandy soil. It will tolerate a pH anywhere in the range of 4.3 to 8, and will grow in full sun or partial shade. However, C. camphora does not do well in wet soils. Established trees are tolerant of drought. Occurs primarily in drier disturbed areas such as roadsides and fencerows, but has invaded natural areas such as mesic hammocks, upland pine woods, and scrubland. WAC (UNDATED) indicates that C. camphora flowers are hermaphroditic. The fruit ripens in autumn and turns black when ripe. Seeds of C. camphora have poor germination due to a hard seed coat. Recommended citation: Global Invasive Species Database (2019) Species profile: Cinnamomum camphora. Downloaded from http://www.iucngisd.org/gisd/species.php?sc=291 on 21-04-2019. Murray and Ramey (2003) note that C. camphora grows like a weed, infesting forests and displacing native trees. According to LCD (2000), C. camphora fruits, leaves, and roots are toxic to humans in large doses. They contain chemicals that stimulate the central nervous system and may affect respiration or cause convulsions. In Chinese medicine, camphor is forbidden for pregnant women and those with a deficiency of vital energy or yin. Preventative measures: A Risk Assessment of \r\r\nCinnamomum camphora for Hawai‘i and other Pacific islands was prepared by Dr. Curtis Daehler (UH Botany) with funding from the Kaulunani Urban Forestry Program and US Forest Service. The alien plant screening system is derived from Pheloung et al. (1999) with minor modifications for use in Pacific islands (Daehler et al. 2004). The result is a score of 7.5 and a recommendation of: \"Likely to cause significant ecological or economic harm in Hawai‘i and on other Pacific Islands as determined by a high WRA score, which is based on published sources describing species biology and behaviour in Hawai‘i and/or other parts of the world.\"
Physical: According to Starr et al. (2003), small seedlings of C. camphora can be hand pulled or grubbed out. It is important that the roots are removed otherwise the tree could regrow. Chemical: Foliar spray with herbicides on young Cinnamomum camphora trees up to 3m tall is also effective. Basal bark or cut stump herbicide treatments are effective for trees up to 6m , or with a basal stem diameter up to 30cm with no multi stems. For basal bark, spray from ground level up to a height of 30cm or higher than where multi stems branch. Informations on Cinnamomum camphora has been recorded for the following locations. Click on the name for additional informations. Department of the Environment and Heritage (DEH) Australia., 2005. Threatened Species and Threatened Ecological Communities. Cinnamomum camphora, Camphor Laurel most toxic chemotypes. Summary: Advice to the Minister for the Environment and Heritage from the Threatened Species Scientific Committee (TSSC) on Amendments to the List of Key Threatening Processes under the Environment Protection and Biodiversity Conservation Act 1999 (EPBC Act): Cinnamomum camphora, Camphor Laurel most toxic chemotypes. Available from: http://www.hear.org/pier/species/cinnamomum_camphora.htm [Accessed 5 February 2003]. Starr, F. Starr, K., Loope, L. 2003.Cinnamomum camphora. United States Geological Survey-Biiological Resources Division. Summary: A description of management and control procedures of C. camphora. Available from: http://www.hear.org/starr/hiplants/reports/pdf/cinnamomum_camphora.pdf [Accessed 26 July 2003]. FFI (Florida Forestry Information). 2003.Cinnamomum camphora. University of Florida. Summary: A short summary on the description of C. camphora. Florence J., Chevillotte H., Ollier C. & Meyer J.-Y. 2007. Cinnamomum camphora Base de donn�es botaniques Nadeaud de l Herbier de la Polyn�sie fran�aise (PAP). Summary: A report on various aspects of C. camphora. Available from: http://www.floridata.com/ref/c/cinn_cam.cfm [Accessed 25 July 2003]. Murray, A., Ramey, V. 2003.Camphor Tree. University of Florida, IFAS, Center for Aquatic and Invasive Plants. Summary: A short summary of the biology and ecology of C. camphora. RGIS (Rockledge Gardens Information Sheet). UNDATED. Camphor Tree. Summary: This site describes a similar species. Available from: http://www.rockledgegardens.com/factsheets/camphortree.pdf [Accessed 12 August 2003]. Summary: A brief description of the various names of C. camphora. Available from: http://www.ars-grin.gov/cgi-bin/npgs/html/tax_search.pl?Cinnamomum+camphora [Accessed 25 July 2003]. USDA-NRCS (United States Department of Agriculture). 2002. Cinnamomum camphora. The Plants Database, Natural Resource Conservation Service. Available from: http://plants.usda.gov/java/profile?symbol=CICA [Accessed 25 July 2003]. World Agroforestry Centre (WAC). UNDATED. Cinnamomum camphora. International Centre for Research in Agroforestry (ICRAF). Summary: A brief summary on the biology of C. camphora. Available from: http://www.worldagroforestrycentre.org/Sites/TreeDBS/Aft/SpeciesInfo.cfm?SpID=528 [Accessed 26 July 2003].